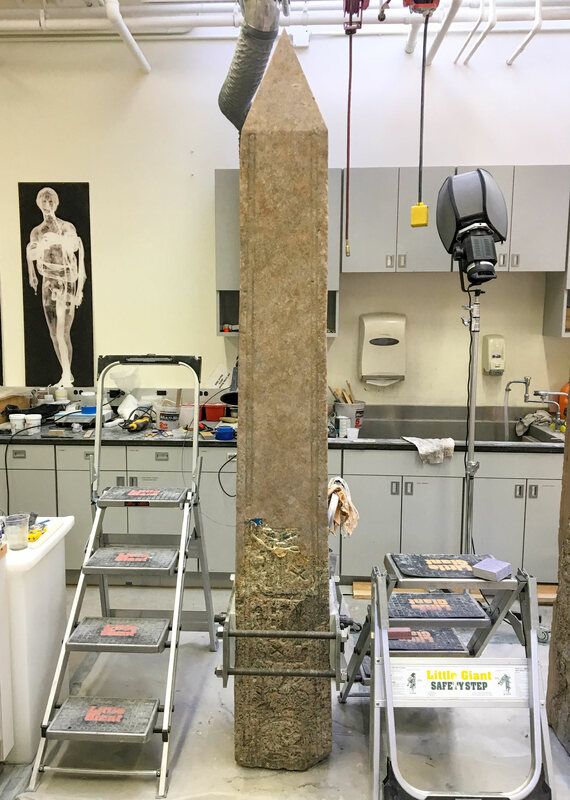 An obelisk from the collection of the Museo del Sannio in Italy, discussed on The Iris here and here, has undergone quite a transformation during the last several months in the Getty Villa’s conservation studios. 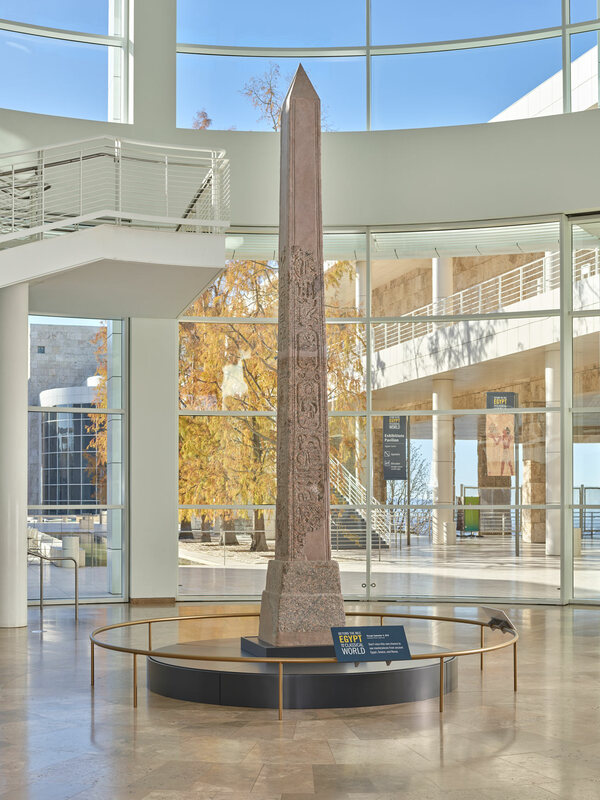 It is now on view in the Museum Entrance Hall at the Getty Center, where it introduces the exhibition Beyond the Nile: Egypt and the Classical World. 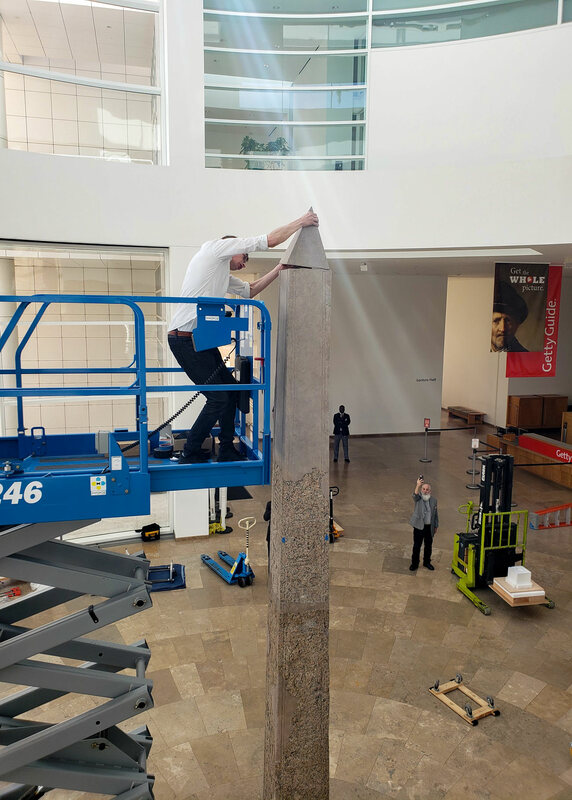 Getting to this stage was a team effort that paired a curator’s research with conservators’ innovation, creativity, and literal heavy lifting. 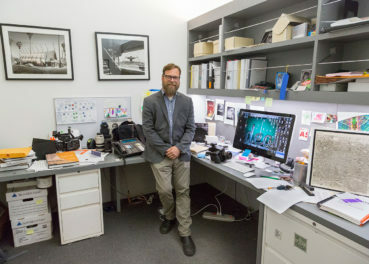 Antiquities curator Sara E. Cole invited conservators Erik Risser and William Shelley to chat about the details of their work so we could share it with you here on The Iris in their own words. 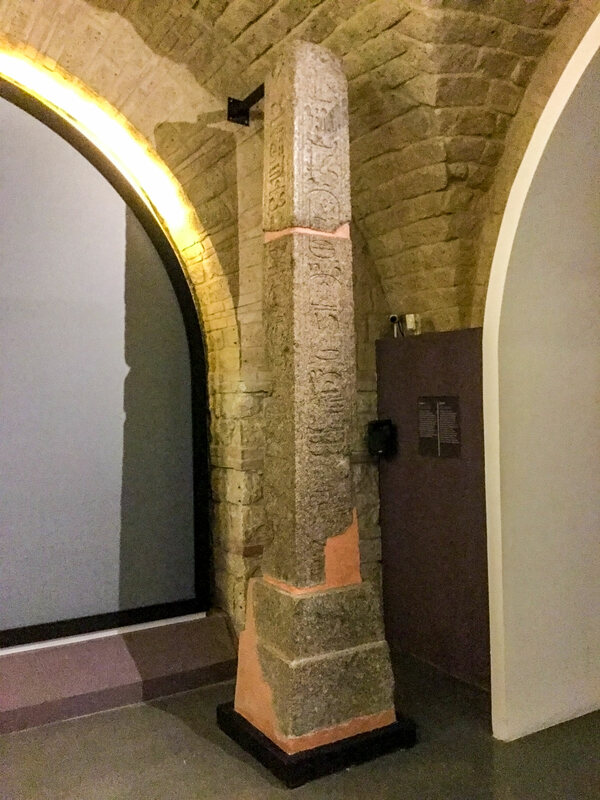 Sara E. Cole: The obelisk has been part of the Museo del Sannio’s collection since the late nineteenth century, and has been on view there for over 100 years. What was its condition when it arrived at the Getty—why did it need to undergo conservation treatment? Erik Risser: When I first saw the obelisk, it was on display in a subterranean vaulted space in Benevento. It was already clear that it was missing over a third of its total height, and that it had undergone extensive interventions in the past. We had in mind to recreate the upper portion of the object to make it intelligible as an obelisk, but in order to even begin to think about that, we had to consider that it was in three fragments, all of which were somewhat compromised. So we had to look at the condition of each fragment individually, and how these related to each other. The obelisk had several fills, which showed that it had had recent interventions, most likely after the 1950s. For stability, it had to be displayed with a physical connection to a wall at its highest point. We wanted to display the obelisk in the round in a much more open space than in Benevento. This would be very difficult to do. It would mean that the obelisk would have to be structurally viable to stand under its own weight. As to the nature of the obelisk’s condition, there were blind cracks and several discernible through cracks. But what was their extent? Had they been consolidated, and, if so, to what degree? Those were big unknowns, not to mention the relationship of each fragment to the other and if they were pinned together. It wasn’t really until it came here and we were able to better identify the condition of the granite and the materials involved in and the extent of previous interventions that the true nature of what we needed to do came into focus. SC: What were the major steps in the obelisk’s conservation? William Shelley: First we gathered as much information as possible about the obelisk and its history. This helped us understand its condition and the materials used in past interventions, and how these may relate to that history. After we did this, we tackled the issue of the fissures and cracks in the granite. They had to be consolidated to stabilize all three fragments. Our next step was to remove all the unstable or undesirable fills and restoration materials. 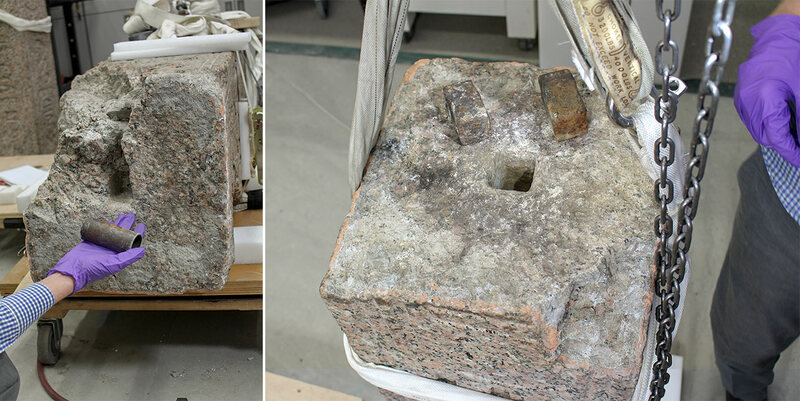 We discovered that the obelisk was held together with a large hand-forged iron pin, and this assemblage was held to the base with a section of steel tubing. WS: Removing the large fills in the base and the lower section of the obelisk revealed that those fills were made up of bricks and mortar. 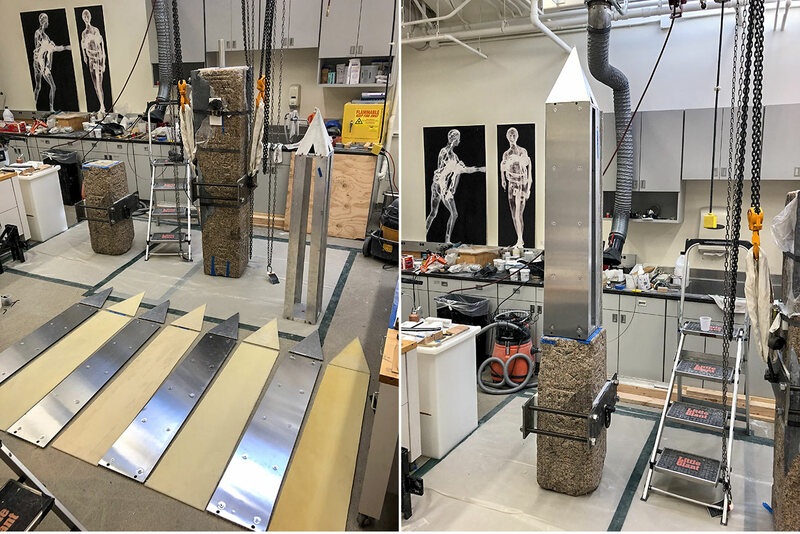 Because of all this, we needed to develop new cast structural fills that could be easily removed and that would work in concert with a new pinning system. The pinning system was designed to allow for repeated assembly and disassembly, so the object could be installed for the exhibition, de-installed for shipping, and then re-installed back in Benevento. The final stage of the work was the recreation of the upper 30% of the obelisk, including the pyramidion. The completed obelisk is about 19 feet high and weighs around 2.5 tons. SC: The obelisk had significant structural issues that you addressed, particularly the need for it to stand without any external support, but it also looks very different now. How do you balance structural and aesthetic concerns when conserving an object like this? ER: By making all interventions as reversible or retreatable as possible. Oftentimes the ideals of structural stability and reversibility can seem at odds, but if you can design things like the fills or the pinning with the idea of reversibility in mind from the beginning, it’s often possible to achieve both. 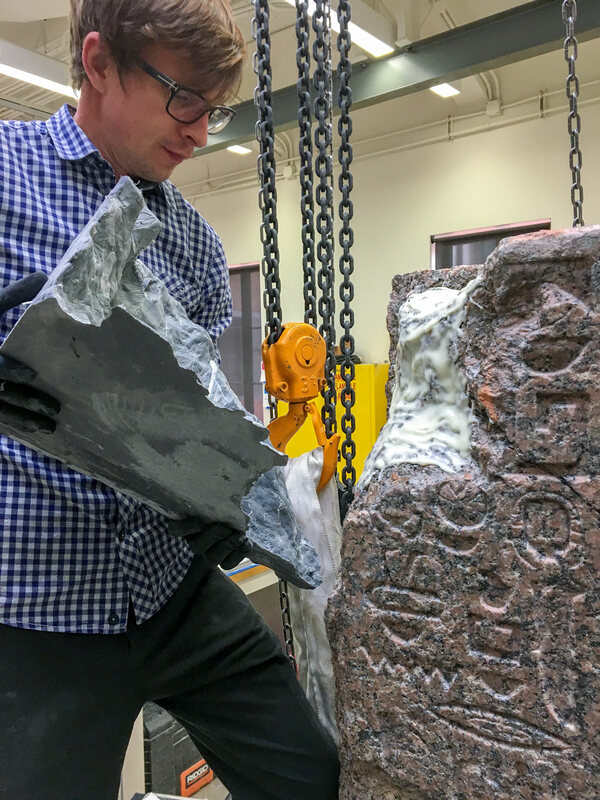 Our goal was to be able to break the obelisk down into its four components – the ancient base and two shaft fragments, plus the new upper portion – without specialized equipment or materials. We also wanted to create interfaces with specific shapes in relation to the broken stone surfaces, which would allow them to key in place or be held together through focused magnetism. The pinning drew on the inherent weight of each successive fragment to avoid the use of resins to hold the assemblage together. WS: About half the base was missing. That was a real structural concern—the surviving ancient portion of the base simply wasn’t enough for the obelisk to stand on. The obelisk itself was missing about 40% of its lower portion. Without a fill, it just wouldn’t stand up. 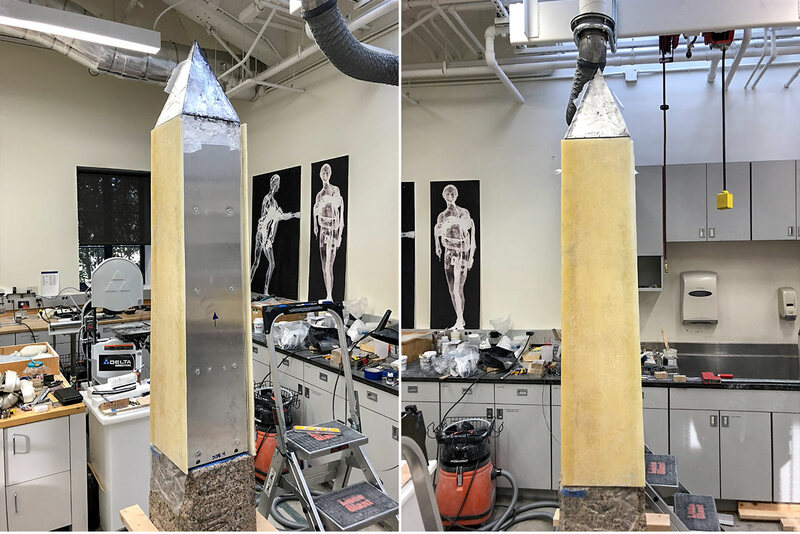 WS: For the fills in the base and the lower part of the obelisk, our goal was to create something that could support all the weight and that would work in harmony with the stone. The large fill in the base takes the entire weight of the obelisk. We cast that fill and adhered it in place with a soluble, reversible resin. ER: The fill in the missing lower corner of the obelisk is structural as well and, accordingly, chemically adhered in place, but the smaller fills up above it are held in place with magnets. You can remove them manually in a matter of minutes. SC: The color of the fills involved a lot of discussion and experimentation. We considered several possibilities: a faux-granite that would blend in with the ancient material, a marbled surface that would have the same color qualities but still be distinguishable from the ancient material, or a monochromatic tone. In the end, how did you make decisions about the color? ER: We made all decisions in conversation with our partners in Benevento. For some of the thornier issues, like how to color and finish the surface of the fills, those decisions were made in Italy by committee. We gave them examples of different options and made decisions based on their feedback. 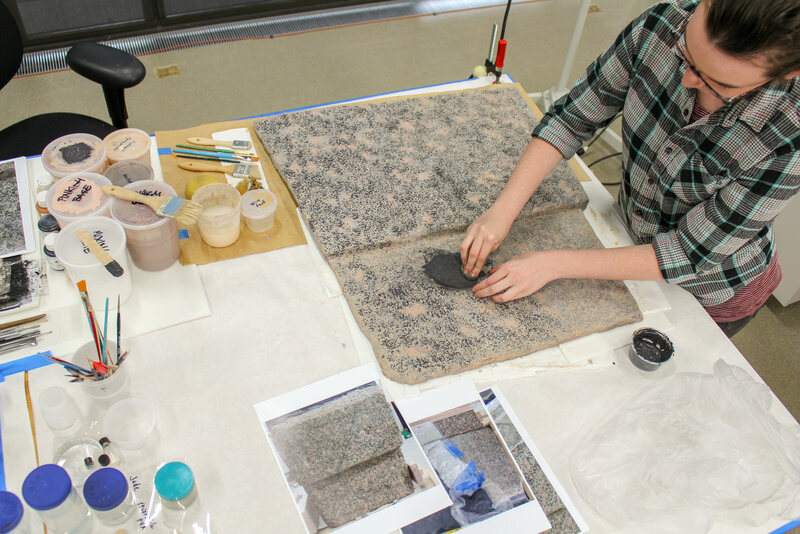 WS: The team decided that a flat paint color would be best—one that would hold the basic color values of the granite and that was offset, but not tremendously so. But even that is a tall order, because within the granite you have whites, reds, blacks, greys, and pinks. If you have a single color, it stands out more in some places and blends better in others. SC: Let’s talk about the upper portion and pyramidion of the obelisk, which has never been found. There were rumors—mentioned in passing by a couple of authors centuries ago—that the missing fragment had been incorporated into a church wall in Benevento. I think it’s also possible that at some point (before all of the fragments of the Museo del Sannio obelisk were discovered) it was carved down to form the pyramidion that now stands atop the twin obelisk in Benevento’s Piazza Papiniano, but there’s no documentation to confirm this. Its fate may have to remain a mystery. Because of this, a lot of research went into determining the proportions of the missing section; can you summarize the work? ER: We were fortunate to have a sister piece. This obelisk is one of two; as you mention, it has a more complete twin in the Piazza Papiniano in Benevento. We were able to take measurements of the other obelisk and then conform ours. Another approach was to look at the hieroglyphs. The inscription on the Piazza Papiniano obelisk is intact, meaning that the shaft is not missing any height. We can therefore estimate how much additional height would be needed to complete the essentially identical inscription on the Museo del Sannio obelisk. WS: The proportions of the pyramidion, however, were questionable because the pyramidion on the Piazza Papiniano obelisk does not seem to be ancient. So we looked at historical precedents from other obelisks, particularly the obelisk in the Piazza Navona in Rome, which is closest to the Museo del Sannio obelisk in date. We created a scale drawing on paper of what remained of the obelisk, and what it would look like reconstructed. We then put in pyramidia with different heights and angles and determined what proportions looked right. Finally, we created a scale model to understand how it would translate into three dimensions and how it would look from different angles. ER: The new upper section had to be very lightweight. We had to add about seven feet of height, but in as light and stable a way as possible. We went with an aluminum honeycomb shell with resin panels. 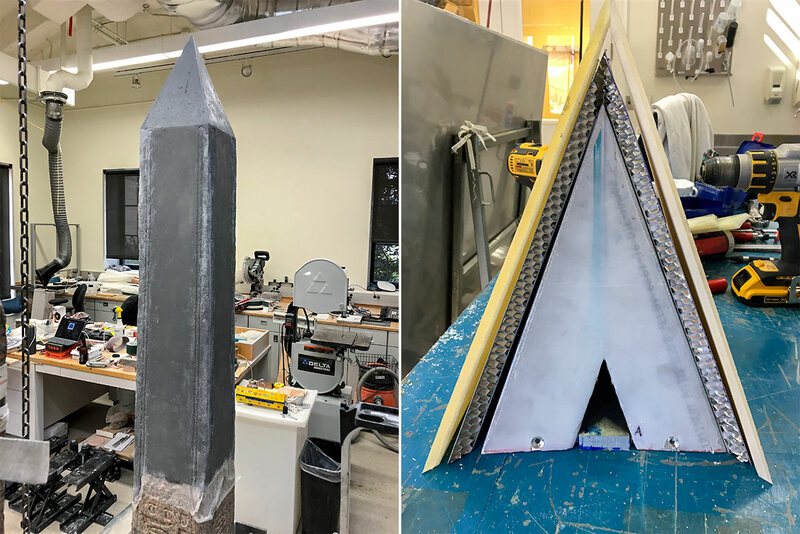 In our photos of the process, you can see these layers in the cross-section of the pyramidion (bottom row below, right). ER: The top weighs a little over 100 pounds, and it’s attached mechanically so that you can easily take it off and put it back on. SC: This project was part of a new partnership between the Getty and the Museo del Sannio. Now that the conservation of the obelisk is complete, are there plans for any future collaborations between the two institutions? ER: We certainly hope so. We were incredibly fortunate that Benevento was willing to lend this to us, that they were willing to work with us, and we couldn’t have asked for better partners. With the archaeological and historical richness of that area of Italy, if there is any way in which we could continue to collaborate, that would be fantastic. I hope that this will only be the beginning. 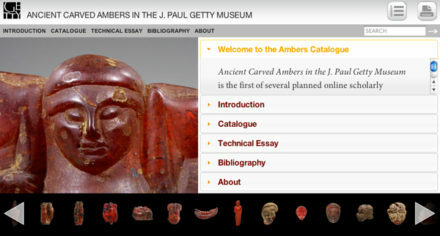 I’m assistant curator in the Antiquities Department at the J. Paul Getty Museum. 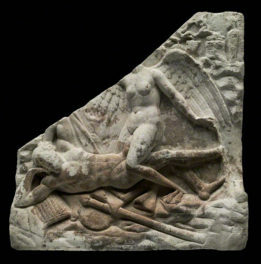 My research focuses on the visual culture of Graeco-Roman Egypt and cross-cultural exchange in antiquity. I’m a co-curator of the exhibition Beyond the Nile: Egypt and the Classical World; I also work with ancient glass, and curated the exhibition “Drink that you may live”: Ancient Glass from the Yale University Art Gallery in New Haven, CT.